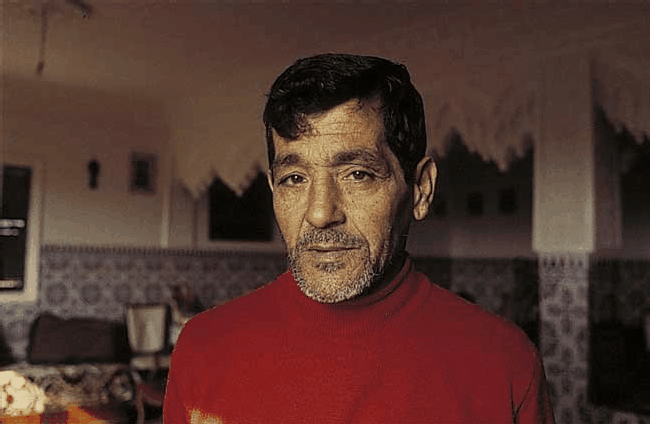 Mohammed Mrabet (born Mohammed ben Chaib el Hajjem) first met Jane and Paul Bowles in Tangier, Morocco in 1960 when he was working on floors in their apartment building, the Edificio Itesa. Paul Bowles later taped, transcribed and translated most of Mrabet's stories from Moghrebi into English, and published largely with the help of Paul Bowles. Mrabet is a story-teller whose works have been published worldwide, and he has also painted for several decades. 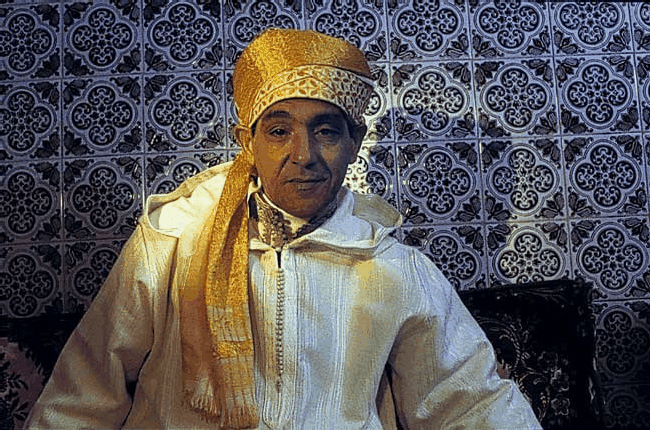 Abdelaziz Jadir, a Moroccan professor of literature who visited Paul Bowles regularly in his last years, is currently working on an Arabic translation of Mrabet's story "Love With A Few Hairs". 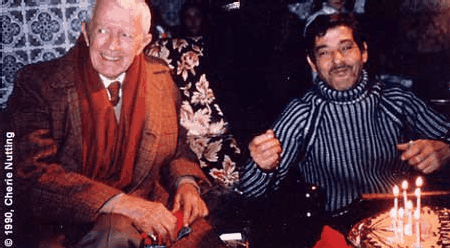 View photographs of the four other Moroccan writers and storytellers who Paul Bowles worked with on this page. 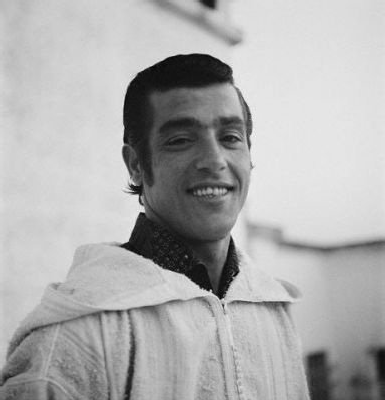 Mohammed Mrabet was born on March 8, 1936 in Tangier, in the north of Morocco. 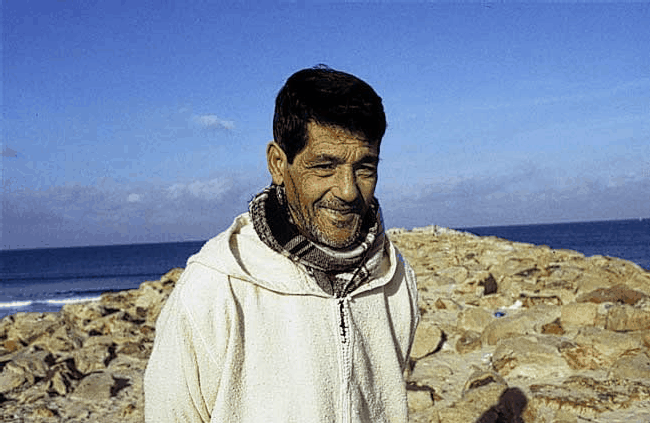 His forefathers had come from the Rif but moved to Tangier before the city was declared an International Zone and had settled down outside the town in a district that today is called M`sallah. Like many Moroccan adolescents, he preferred to live in the freedom of the street rather than staying at home and subordinate to discipline. He never went to school and made his living as a fisherman, worked in European bars and households, and as a boxer traveled through Spain and Mallorca. Out of curiosity and looking for big money, Mrabet went to the United States for the first time in 1960 and two more journeys followed, but the country did not impress him much. Back in Tangier in 1960 he met Jane Bowles and her husband Paul Bowles, the expatriate American composer and writer. Through his close friendship with the Bowleses, Mrabet met important writers such as Tennessee Williams, Alfred Chester, William Burroughs and Truman Capote. Although known primarily as a Moroccan storyteller, Mrabet began making ink drawings in 1958, and later paintings, partly inspired by Ahmed Yacoubi. In Tangier he was acquainted with other artists such as Maurice Grosser, Brion Gysin and Claudio Bravo, and he continues painting to this day. 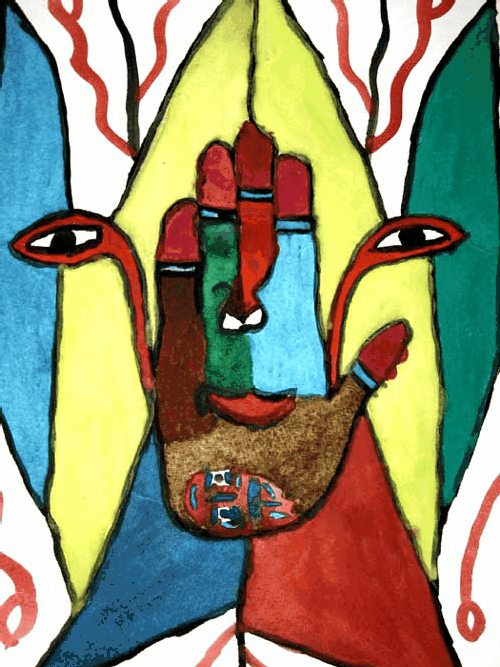 Mrabet's paintings and ink drawings have been exhibited in Morocco, Europe and the United States. 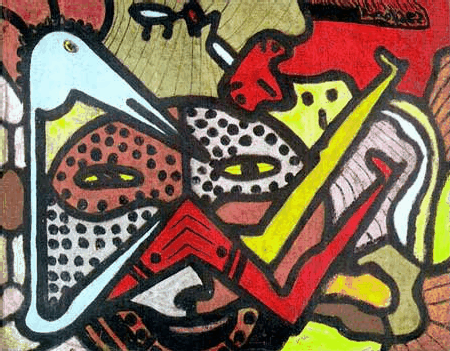 His drawings and paintings are held in numerous private collections and institutions. 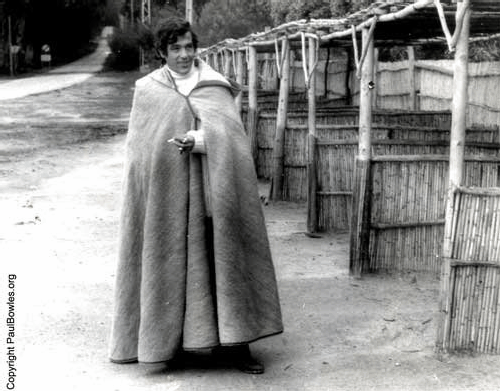 During his childhood Mrabet listened to traditional story tellers in Tangier´s cafés―a world that fascinated him. 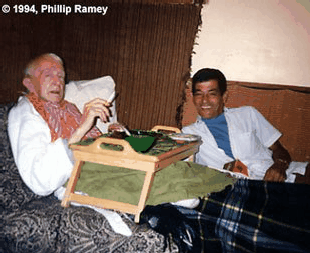 Later on he would invent his own stories, and Paul Bowles taped and transcribed his stories. Mrabet´s first novel Love with a Few Hairs was published 1967 in London by Peter Owen, followed two years later with The Lemon. Since then, seventeen books written by Mohammed Mrabet have been published and his works have been translated into twelve languages. Henry Miller wrote: "Mrabet sees what it means to work simply and tellingly. His writing is quite unique and an inspiration not only to young writers but to veterans too. He has found the secret of communicating on all levels." The language of Mrabet is a maze like the thousand alleys of the Medina―seductive, but dangerous―without a guide one is lost in suggestions and allusions. His culture does not lend itself to our limited rational thought―the only way is by feeling into it, not thinking. Otherwise one remains dazzled by what one sees and does not enter the deeper secrets; hence it would be foolish to tell a story as it was. "A tongue tells a thousand truths, but you always only want to hear one." says Mrabet. Again and again in the stories of Mohammed Mrabet, the tensions between two cultures become clear: they reject themselves like opposite poles and only seldom come together. ROBERTO DE HOLLANDA was born in Madrid, Spain in 1953. He grew up in South America and Europe, graduated at Friedrich-Wilhelms University, Bonn, Germany (sociology and political science) and works as a free-lancer. 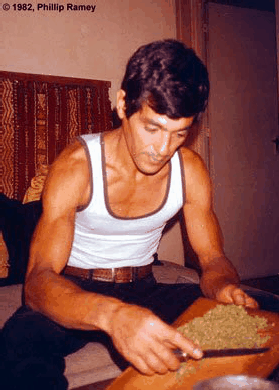 He has done translations of known authors such as Gonzalo Torrente Ballester, Almudena Grandes, Tom Robbins, Nestor Lujan, Rodrigo Rey Rosa, James Dickey, Jan Kerouac, Bob Woodward and others. de Hollanda wrote the scripts for and/or directed television productions which include Neugier trieb uns um die Welt: Paul Bowles in Tanger, a documentary on the American author Paul Bowles and the German composer Hans Helfritz, Tangier―Legend of a City, a feature film on the International Zone of Tangier in the 1940s and 1950s, and Mohamed Choukri: eine Kindheit in Marokko, a documentary on the life of the Moroccan writer. Roberto de Hollanda also represents authors as literary agent worldwide, among them Mohamed Choukri, Mohammed Mrabet, Souad Bahéchar and Zoubeir Ben Bouchta. The Boy Who Set the Fire and Other Stories (Los Angeles: Black Sparrow Press, 1975; San Francisco, City Lights Books, 1988). Translated by Paul Bowles. Includes "What Happened in Granada", "Si Mokhtar", "Baraka", "The Saint by Accident", "Abdesalam and Amur", "The Witch of Bouiba Del Hallouf", "The Dutiful Son", "Bahloul", "The Spring", "The Boy Who Set the Fire", "Mimoun the Fisherman", "Ramadan", "Larbi and His Father", "The Well", "The Hut", "Doctor Safi" and "The Woman from New York". The Beach Cafe & The Voice (Santa Barbara: Black Sparrow Press, 1976); in French, Le café de la plage (Paris: Christian Bourgois Éditeur, 1989; translated by Claude Nathalie Thomas). 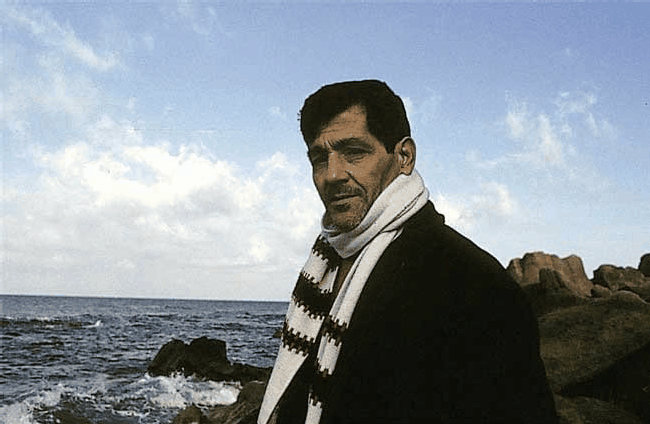 In 1998 the Moroccan-born filmmaker Mohamed Ulad Mohand produced a film version of Le café de la plage (Azilah Productions, Paris, France). The film was presented at film festivals in Vila do Conde, Portugal and São Paulo and Rio de Janeiro, Brazil. Stories de Tanger / Stories of Tangier, by Mohammed Mrabet with Simon-Pierre Hamelin, manager of Le Librairie des Colonnes bookshop in Tangier (Casablanca, Maroc: Éditions du Sirocco, November 2009. En version bilingue français et anglais. Le première édition marocaine des histoires de Mrabet.) 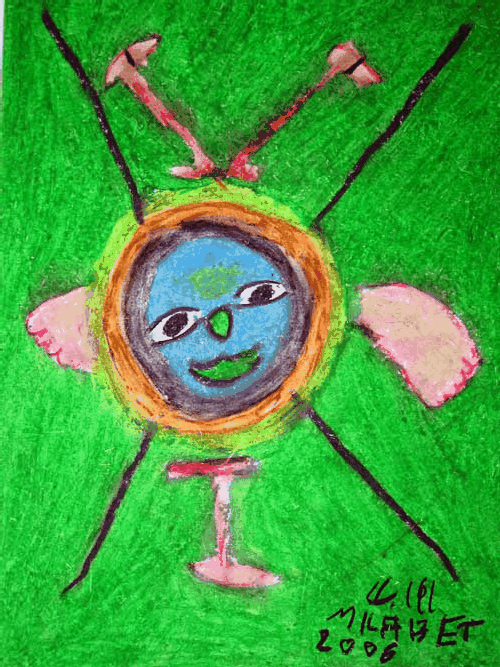 Includes the short story "Djellaba of a Thousand Colors", and fifty original paintings and drawings by Mrabet. The French texts were translated into English by William Kutz. Read a book review of Mrabet's Stories de Tanger, "Histoires d’une réalité magique: Stories de Tanger de Mohammed Mrabet" in the February 5, 2010 issue of l'Opinion newspaper, written by Saïd Afoulous. With Much Fire In the Heart: The Letters of Mohammed Mrabet to Irving Stettner, with an introductory note by Ron Papandrea (Dallas, Pennsylvania: Stroker Press, 2004). These letters, translated by Paul Bowles, were originally published in various issues of Stroker magazine from 1979 to 1986. Raj Chandarlapaty, "In Defense of Tradition: Mohammed Mrabet's Postcolonial Leanings and The Confrontation of 'Kif Wisdom' With Modernity", Storytelling, Self, and Society, vol. 3, no. 1 (2007), 32-49 (Mahwah, New Jersey: Taylor & Francis). Originally published by Lawrence Erlbaum & Associates. 1970 The offices of Antaeus, New York, New York, U.S.A.
Feb. 1999 University of Charleston, Charleston, South Carolina, U.S.A.